Starbucks today released a new application for Microsoft's Windows 10 Mobile platform. The app, available in the U.S., U.K., and Canada, allows Windows users to find stores, manage account details, and make payments. 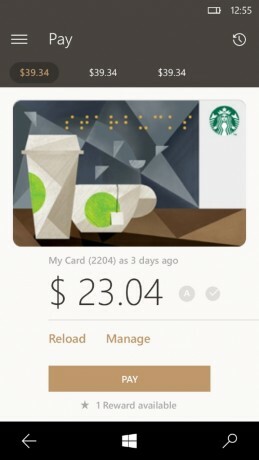 People can use the app to send e-gifts, check their account balance and transactions, leave digital tips, and track Starbucks rewards. Starbucks for Windows 10 Mobile is free to download from the Windows Store.